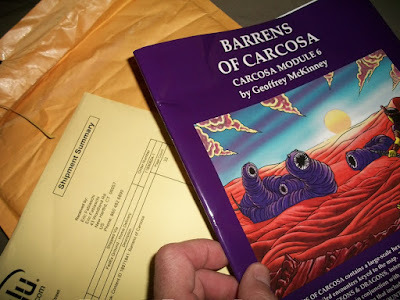 So my other half splurged & grabbed me a copy of Barrens of Carcosa By Geoffrey Mckinney, this is a thirty two page adventure module for Advanced Dungeons & Dragons 1st edition. This is a really interesting variation of the tradition Carcosa that we've seen from the pen of the author. 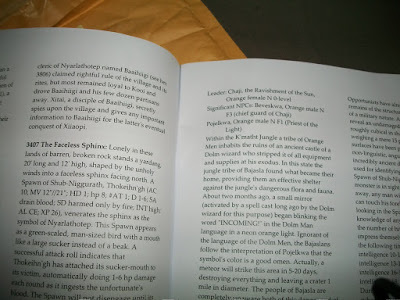 Barrens of Carcosa could be thought of as the first of the series of AD&D modules in the sense that this book contains many of the usual setting conceits we've come to know and love from Carcosa. In fact I'd go so far as to call this Carcosa III Fallout Tactics; because it uses many of the elements we know and love with Carcosa. But the adventure uses them in ways that I wasn't expecting. The encounters here are keyed with more conventional AD&D 1st edition monsters and it gives the Barrens of Carcosa a far more grounded feel. Tribes, wizards and others here are far more grounded in the setting. There are several key Lovecraftian NPC's and elements from the literature of HP Lovecraft himself from the City of Pillars with its ruler Abdul Alhazared to meta mix appearances by the Great Race. But this material is taking advantage of the multi dimensional nature of Lovecraft's creations which are hinted at within the literature and taken full at advantage of within the Barrens. 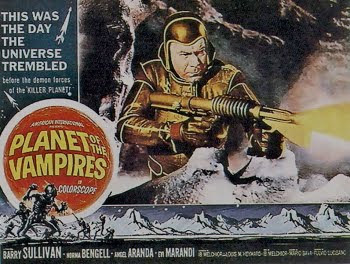 Major send ups of pop culture horror and fantasy icons as encounters including the Phantasm series and several movie references scattered as Easter eggs throughout. A very subtle and neat touch for this adventure. 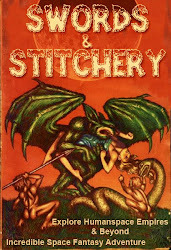 Because this is meant as an AD&D 1st edition adventure there's lots of potential to cross this over into OSRIC or other Advanced Labyrinth Lord Companions style adventures this means more potential for parties to visit and be stranded on Carcosa. Lots and lots of hexcrawl weirdness which if parties are not careful could easily mean a complete and utter TPK. Barrens Carcosa seems a bit more accessible for traditional AD&D dungeon masters but those with other editions of Carcosa should be easily able adapt this module as they need to. Certain encounters and locations are going to need to be fleshed out by the DM as major adventure locations because they scream for it. Cities, villages, and towns are pretty much in the Carcosian tradition. For those who own Realms of Crawling Chaos from Goblinoid Games this is a great module to take on as an advanced option for play it has many of the Lovecraftian elements that book talks about in play. Barrens of Carcosa adds in another layer of forbidden vistas and weird sword & planet adventure to the mix of OSR goodness. Barrens is an affordable way to get into the deep end of the Carcosa experience and its a great book to use as a template for your own sword and ray gun campaigns. Barrens isn't perfect, the adventure is a mixed bag weirdness and several of the encounters have the potential to really work over a party of adventurers but that's to be expected. Could Barrens of Carcosa be used with existing sword and sorcery retroclones such as The Astonishing Swordsmen and Sorcerers of Hyperborea rpg system? I think so but I would hasten to add in some additional material such as the free community based The Carcosan Grimoire. 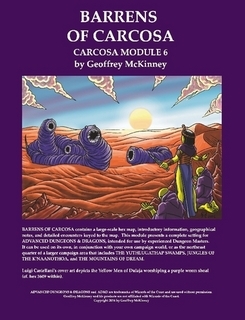 This is a set of free resources for the original OD&D role-playing supplement Carcosa by Geoffrey McKinney. Now the reason why I would add in this material for Barrens is because much of it is OD&D or system neutral and adds in a further level of background material for the adventure giving the DM just another set of tools to play with. I would also like to add in that these adventures could serve as perfect points to drop in side treks with Geoffrey Mckinney's Psychedelic Fantasies in Barrens or one of the other Carcosa locations detailed in his other Carcosa adventures. The lack of artwork didn't bother me at all because I've known what I was getting into when this adventure came out. For me Barrens of Carcosa is a bridge gap into the next phase of the Carcosa line from Geoffrey Mckinney. If your a Carcosian gamer such as myself I think that Barrens is a good addition into the Carcosa line and collection . I also think that there more then enough room in the mix here for DM's to add in their own DYI D&D spin to this Carcosian adventure. Barrens serves as a brand new buffer adventure into the world of Carcosa & if you already own the Lamentations of the Flame Princess edition this book might make good add on. I sure thankful that my other half grabbed this one for me. My advise is to wait to grab it when one of those Lulu codes rolls around as they always seem to and get into the free shipping. Remember to keep those dice rolling.